"If the cost of our struggle is the lives we fought to protect, the future we hoped to see, then what is it we were fighting for?" 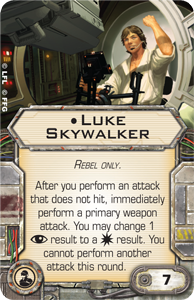 Ever since the release of the original X-Wing™ Core Set in 2012, the Rebel faction has relied heavily upon the synergies between its pilots, their unique abilities, and their upgrades. 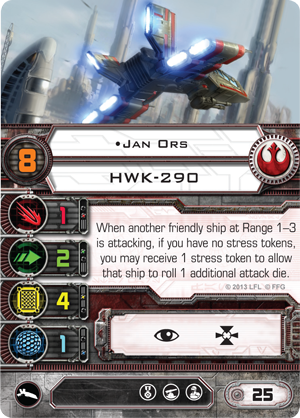 Pilots like Biggs Darklighter and Jan Ors have proven to be Rebel mainstays. 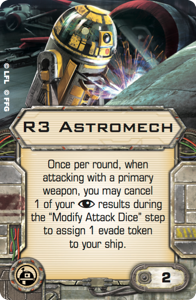 Astromech Droids like R2-D2, R5-P9, and R3-A2 have held their ships together through many tumultuous battles. And ships like the Millennium Falcon have traditionally benefitted from the contributions of such talented crew members as Luke Skywalker, Chewbacca, and C-3PO. 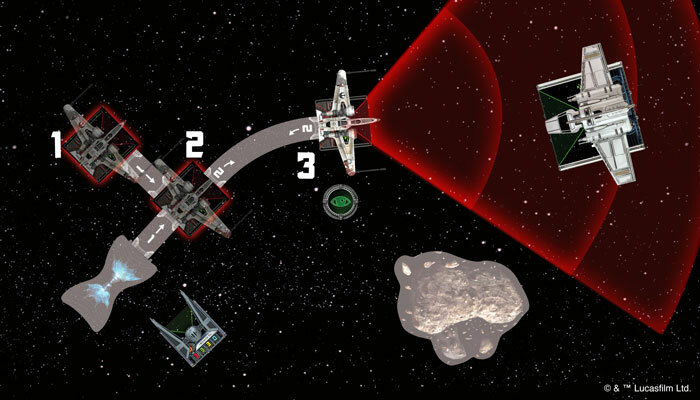 In many ways, the ninth wave of X-Wing starship expansions is a return to basics. All its ships and nearly all of its named pilots appear in canonical materials. Its ships' mobile and auxiliary firing arcs refocus our attention on the importance of our maneuvers, even as they provide us with more options for lining up our shots. And we find the Rebel Alliance empowered by a wealth of new synergies between its pilots, their ships, their talents, and their upgrades. 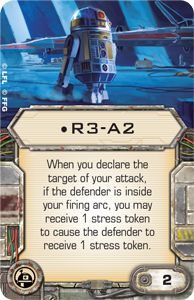 Today, as we dive into the first of our Wave IX previews, we take a closer look at how all these basic elements come together in new forms in the ARC-170 Expansion Pack. The ARC-170 first appeared in Episode III and then again in the Clone Wars television series. Although the ship was somewhat antiquated by the time of the Galactic War, the Rebel Alliance nonetheless recovered, repaired, and retrofitted a handful of them, and they proved they were still a force to be reckoned with. 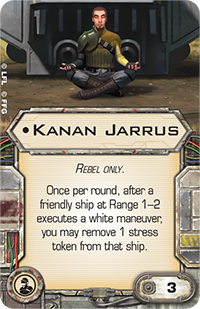 Their powerful cannons, heavy shielding, and tail gunners allowed them to play a unique and valuable role in the Rebel fleet. 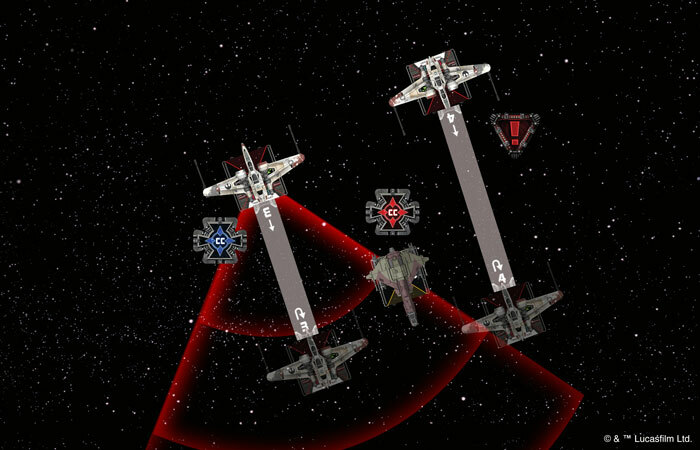 In X-Wing, the ARC-170 appears as a small-base ship with two attack, one agility, three shields, and six hull. 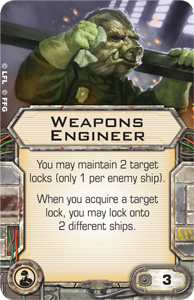 Its ability to field a tail gunner is reflected both in its crew upgrade slot and its auxiliary firing arc—the first such arc to appear on a small-base ship. Naturally, the ship's auxiliary firing arc affords you a measure of freedom in your selection of maneuvers. For example, you might line up a shot from your auxiliary arc by selecting a straight speed "3" maneuver instead of executing a red speed "4" Koiogran-turn, which would cause you to take a stress and lose your ability to perform an action. 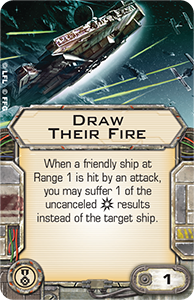 However, the Alliance Overhaul Title upgrade ensures that the ARC-170's auxiliary firing arc enters the game as more than just a free firing arc. 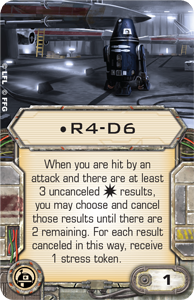 It also introduces a new decision point: do you aim to keep your foes in your primary firing arc and roll three attack dice, or do you allow them to slip into your auxiliary firing arc, hoping to convert a result into a ? The choice becomes more meaningful as you consider how to equip your ship. 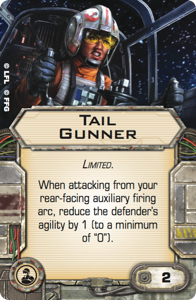 As an example, the new Tail Gunner crew upgrade goes a long way toward making shots from your auxiliary firing arc more attractive. Meanwhile, the ship also features slots for torpedo and astromech upgrades. 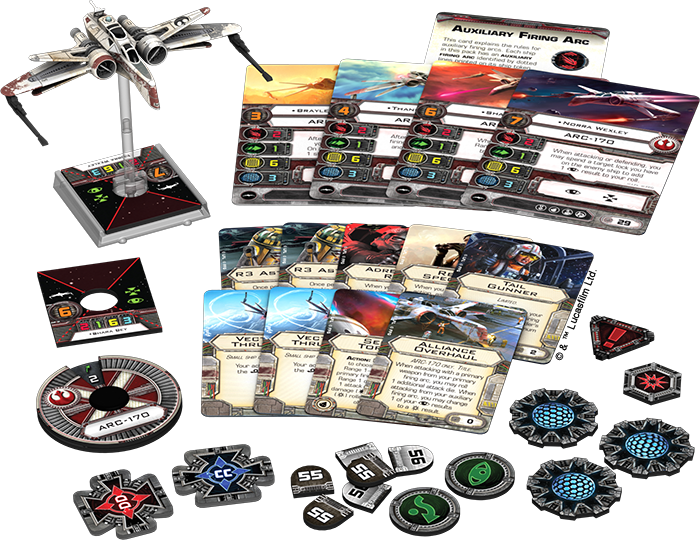 Finally, the expansion comes with four ship cards, each of which corresponds to a unique Rebel ace making his or her first appearance in X-Wing. 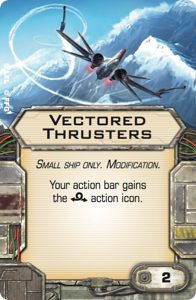 Although they make their X-Wing debut in the cockpit of an ARC-170, the four pilots from the ARC-170 Expansion Pack all flew different ships when they first came to light in the newly canonized Star Wars short stories, comics, and novels. Braylen Stramm first appeared in the short story, "Blade Squadron," published in Star Wars Insider 149-150. A human who joined the Alliance after serving the Galactic Empire on Naboo, Braylen Stramm gained command of Blade Squadron after the Battle of Endor. 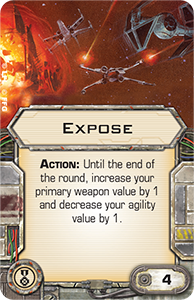 In X-Wing, he flies his ARC-170 with all the cool of someone used to flying the much more challenging B-wing. After Braylen Stramm executes a maneuver, he can roll an attack die. 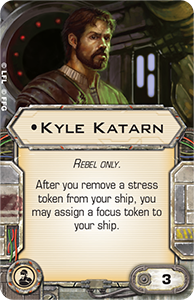 On a or result, he can remove one stress from his ship. Drawn from the pages of Lost Stars, Thane Kyrell was another former Imperial who defected and joined the Rebellion. As a member of Corona Squadron, he took part in the Battles of Hoth, Endor, and Jakku, mostly in the cockpit of an X-wing. 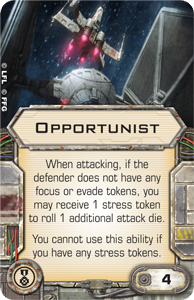 He arrives to X-Wing as a pilot with a pilot skill value of "4" and the ability to perform a free action after an enemy within his firing arc at Range 1–3 attacks another friendly ship. 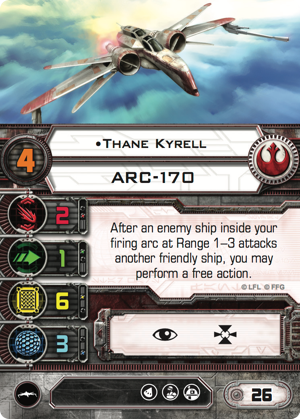 Talented A-wing ace Shara Bey comes to X-Wing from the Marvel comic, Star Wars: Shattered Empire. During the Battle of Endor, she flew with Green Squadron under the call sign Green Four. The Rebel victory there helped to turn the tide of the Galactic Civil War. Nonetheless the war was not yet over, and Shara Bey's continued service to the Rebel Alliance saw her fly missions with both Leia Organa and Jedi Luke Skywalker. 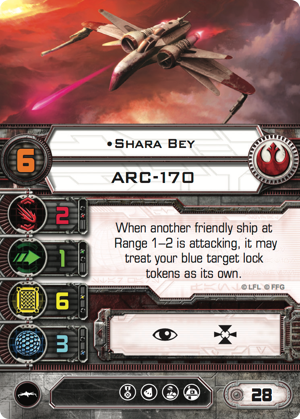 In X-Wing, Shara Bey continues to serve the Rebel Alliance with her talents, offering the benefits of her target locks to any of her wingmates who might need them more. 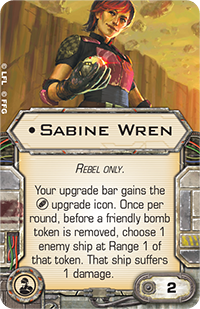 One of the wingmates most likely to benefit from Shara Bey's target locks is Norra Wexley, who entered the Star Wars universe as part of Chuck Wendig's Aftermath. A freighter pilot who joined the Rebel Alliance after her husband was arrested by stormtroopers, Norra Wexley was recruited into combat service by Commander Wedge Antilles ahead of the Battle of Endor. He convinced her that the Rebellion needed her piloting skills in the battle, and she ended up flying a Y-wing into the second Death Star, drawing fire away from General Calrissian and the Millennium Falcon. 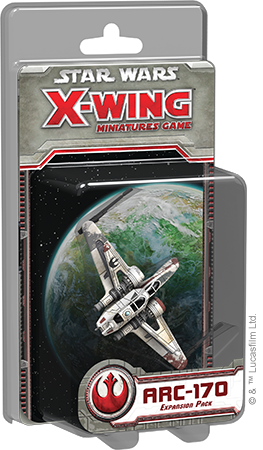 In X-Wing, her skills are reflected by her ability to convert a target lock into an extra result, either while attacking or defending. 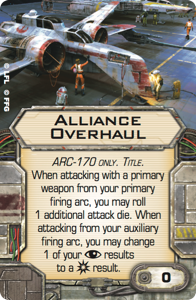 By this point, you've likely noticed some of the potential synergies the different ARC-170 pilots enable. 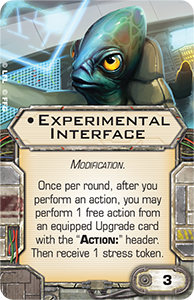 Still, the ship and the expansion promote myriad synergistic interactions that go far beyond its pilots' abilities. 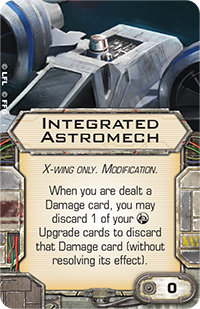 First and foremost, with its unique pairing of crew and astromech slots, the ARC-170 invites you to revisit two whole categories of upgrades in new context. Will you outfit outfit Thane Kyrell's ARC-170 with the C-3PO crew upgrade and R2-D2 astromech, as well as some Vectored Thrusters, forcing your opponents to decide if they want to try to eat through his massive defenses or fire at his wingmates and give him extra actions, including the potential to reposition his ship in the middle of the Combat phase? 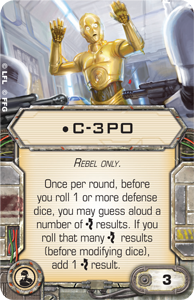 Or would you find it a wiser investment to minimize your expenditure on his upgrades, equipping him with R4-D6 and Hera Syndulla for just two squad points, and relying upon the extra target locks provided by Shara Bey and her Weapons Engineer ? 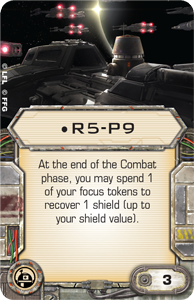 Equipped with R3-A2 and Kyle Katarn , Kyrell can potentially stress his opponents with every attack he makes and still fire his shots with both a target lock and a focus token in every Combat phase after the first. The possibilities are staggering. 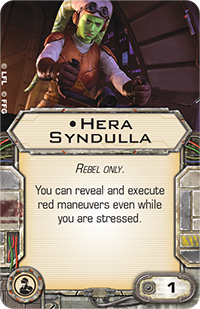 With Sabine Wren and BB-8 aboard, Norra Wexley could even Experimental Interface whenever she reveals a green maneuver to perform a barrel roll, drop an Action bomb like the Conner Net, and then race ahead, finishing her green maneuver and clearing her stress, only to take her standard focus action. 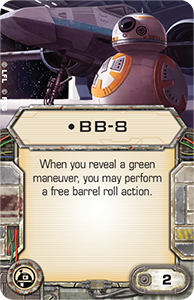 In this diagram, Norra Wexley reveals a green speed "2" right bank, which means that (1) BB-8 allows her to barrel roll right. (2) She uses Experimental Interface after her barrel roll to deploy her Conner Net and then (3) completes her green maneuver to clear her stress. Finally, Norra focuses, ready to take a clear shot at the Emperor's Lambda-class shuttle. Yet the potential combinations seem to arrive from every possible angle. And they only increase as you start to piece together the whole of your squad. 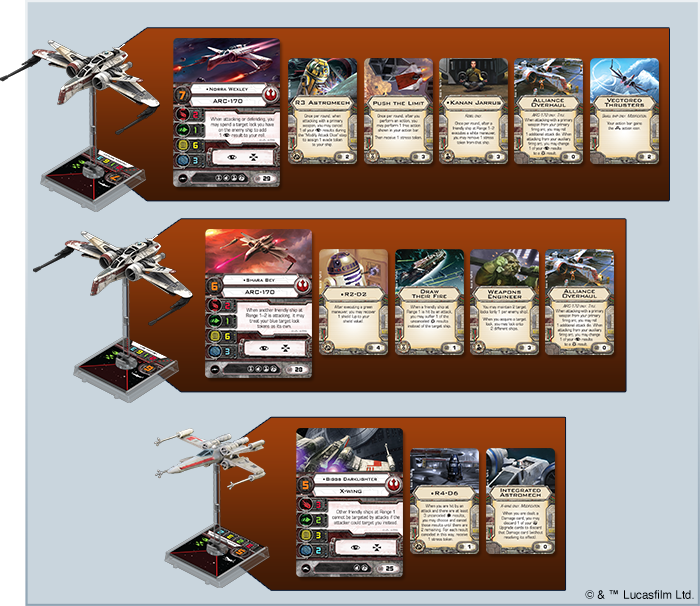 Fans in our community forums have already started to experiment with squad builds that emphasize the sheer number of attack dice Norra Wexley can direct toward a foe when outfitted with Alliance Overhaul, plus either Opportunist or Expose. 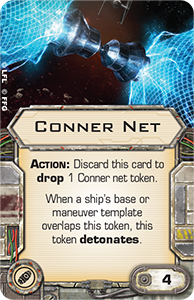 So outfitted, Norra can fly into Range "1" of an enemy ship and focus, before using her Experimental Interface to trigger her Expose. 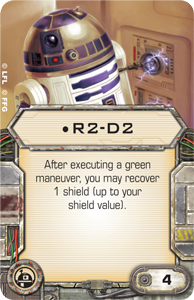 Or if she's just outside of Range "1," she can Expose and have her R7-T1 astromech boost her into Range "1" of her target. Counting the extra result she gets by spending her target lock during her attack, she effectively attacks with seven dice. 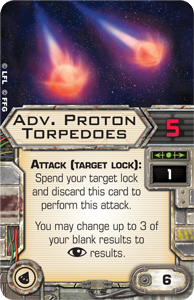 If the attack is made with an Advanced Proton Torpedo, Norra can claim as many as eight attack dice. 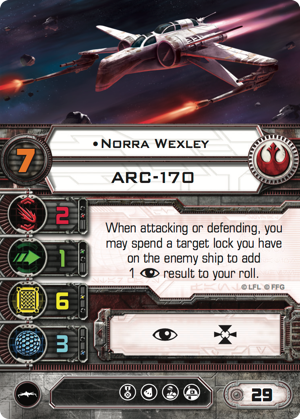 You may not win tournaments by equipping Norra Wexley to fire, effectively, eight red dice, but the effort is still easily worth an entertaining game or two. 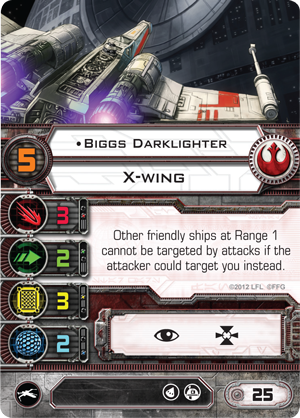 Meanwhile, because it starts at just twenty-five squad points for Braylen Stramm, the ARC-170 is cost-efficient enough that you can easily fit two of them into a three-ship squad along with Biggs Darklighter. Such a squad would rely upon Biggs to cover for the ARC-170's low agility, and it would aim to keep Biggs in the battle for multiple passes by reducing the number of hits he takes via R4-D6 and Draw Their Fire, and by using Kanan Jarrus to free him of his stress even when he performs white maneuvers, allowing him to perform actions more often than one might expect. At the same time, Shara Bey and Norra Wexley take advantage of the ARC-170's strengths, working together to empower Norra's attacks and ensuring that the duo has a good range of tactical options available to them should Biggs eventually fall. 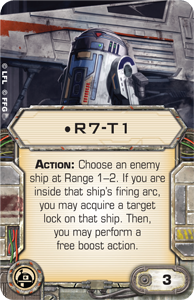 How will you integrate the ARC-170, its pilots, and its upgrades into your Rebel squad once the ARC-170 Expansion Pack arrives at retailers along with the rest of Wave IX? Head to our community forums and share your thoughts. 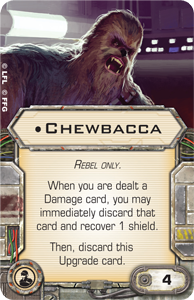 Then, stay tuned for a look at the First Order's Special Forces TIE Expansion Pack!